WINTER HAVEN, Fla. — The theme-park capital of the world is know for its over-the-top, kid-friendly selection of hotels. That said, the latest hotel doesn’t disappoint, especially if you are in the 2 to 12-year-old age range. The new 5-story, 152-room hotel, located next to Legoland Florida Resort, opens its doors May 15. Made up of more than 2 million Lego bricks, it is a sight to see. On the outside: a 15-foot-tall Lego dragon perches on a clock tower greeting guests with the occasional puff of smoke. 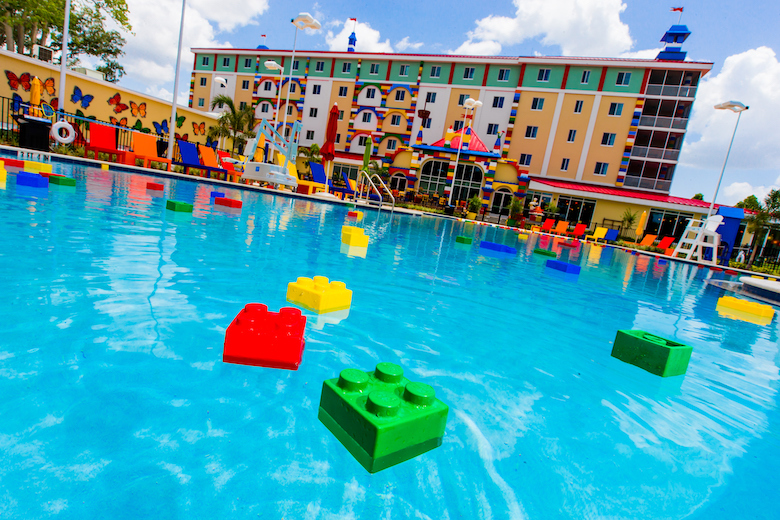 “The outside of the hotel is designed to look like a kid built it with Lego bricks,” says Kevin Carr, general manager of Legoland Hotel. Behind the reception desk, an impressive wall made of more than 5,000 Lego Minifigures makes the check-in process mesmerizing. Plus, kids are welcomed with a special treasure hunt card they can complete once they settle into their brightly colored hotel room. The reward: the combination that unlocks a small treasure chest of Lego surprises. Each room is outfitted with Lego graphics on the walls and Lego models galore. 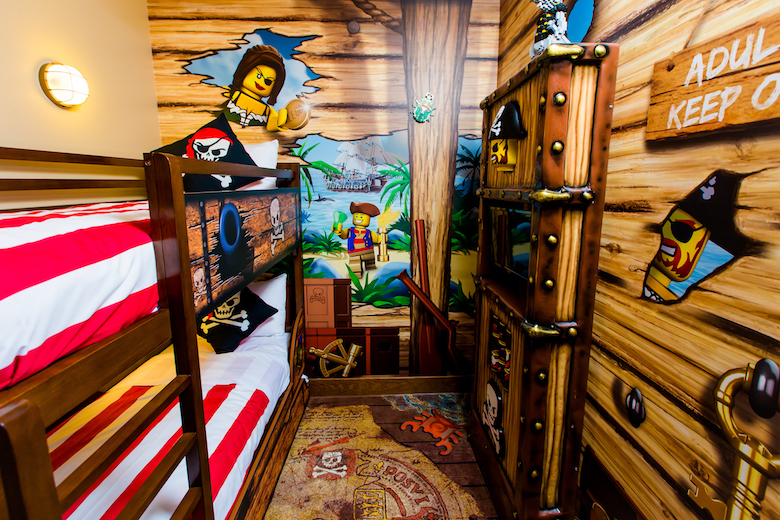 Guests choose from pirate, adventure, kingdom or Friends themed-rooms. Other special kid-focused features include peep holes at a lower level and bunk beds. Back in the lobby, a castle play area based on the Lego Kingdom and Pirates line beckons young ones to run amok. There’s a pirate ship, complete with a blimp, docked along a moat filled with Lego bricks. 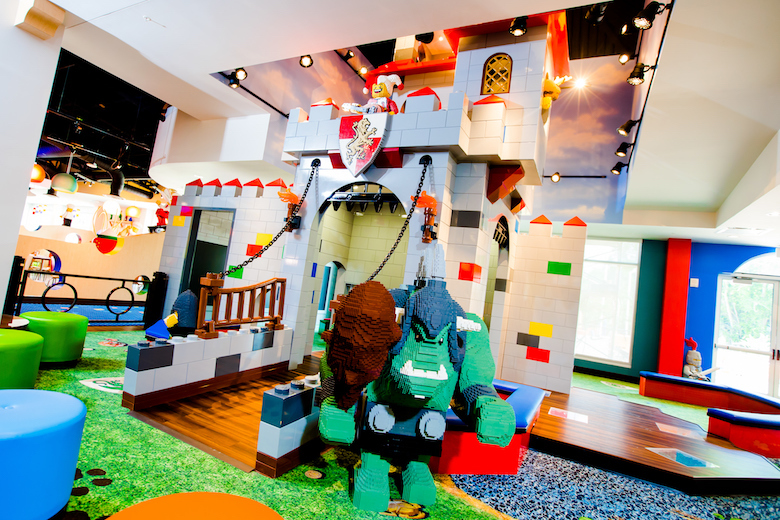 Guests pull on a handle as they enter the castle, which prompts the Lego ogre above them to roar. PHOTO: Chip Litherland for LEGOLAND Florida/Merlin Entertainments Group Inc. When hunger strikes, guests can chow down at Bricks Family Restaurant, an eatery with a buffet station at kid level. Adults will appreciate the Sky Line Lounge, which offers dishes like shrimp and grits, grilled salmon and watermelon, feta and spinach salad. Decor includes a Lego skyline with humorous scenes designed by the park’s master model builders. “Throughout the hotel and around the pool area, you will see a variety of Lego models and Lego décor including four Minifigures on each pillar,” Carr says. There’s even a disco elevator. When guests enter, the lights pulsate along with the music, guests stand on lava tiles, a mirror ball rotates and different sound effects announce arrival on each floor. Better yet, outside the first-floor elevator entrance there is a whoopie cushion on the floor that has accompanying sound effects that will crack up the whole family. But the piece-de-resistance for Lego fanatics is clearly the Master Model Builder Workshop on the first floor where guests will learn how to build Lego models from the Model Builders themselves. In fact, it will be the first Legoland Hotel with a Master Model Builder Workshop inside. The expansion doesn’t end there. This summer, Legoland Florida Resort will open a new themed land called Heartlake City, which will include a disk-coaster ride called Mia’s Riding Adventure; an interactive show called “Friends to the Rescue,” featuring Lego Friends characters, and plenty of places for shopping. The Lego Movie 4-D will also launch at the park later this year. Rooms start at $219. 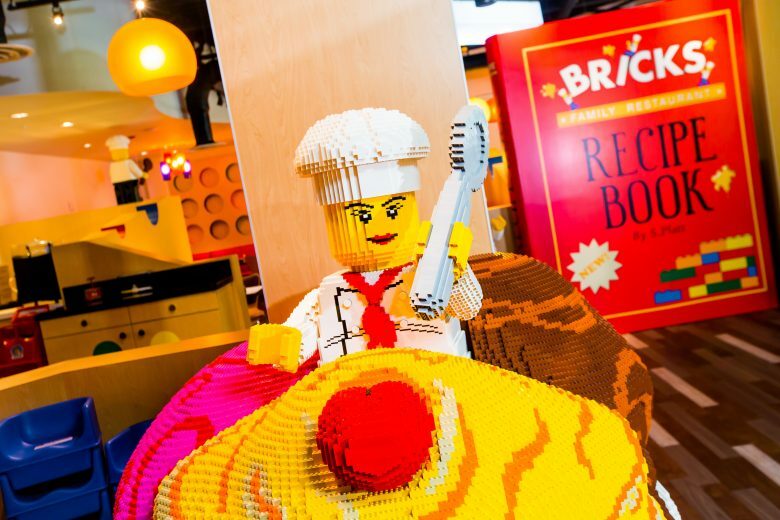 This includes early access to Legoland rides and attractions before the park opens, exclusive access and programming with Master Model Builders in the Lego Model Shop, full daily breakfast and nightly entertainment.